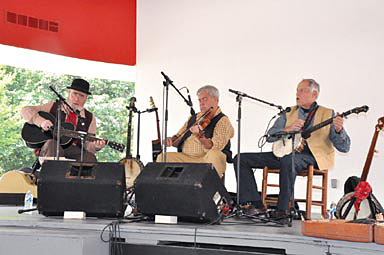 The Maryland-based old-time string band, Roustabout, specializes in American traditional music. Roustabout often performs with Heritage Voices, but is also available for individual bookings, performing traditional music of the American Civil War era, but also offering interactive, hands-on workshops for children and families. Roustabout String Band (left to right, Bruce Hutton, Chris Romaine and Lars Hanslin) performs as part of Montgomery Country Heritage Days at Glen Echo Park. Photo courtesy of Connection Newspapers ©2011. The band, made up of Chris Romaine (fiddle and banjo), Lars Hanslin (vocals, banjo, guitar and banjo-uke), and Bruce Hutton (vocals, guitar, mandolin, banjo and banjo-uke), never fails to entertain with their engaging and interactive style. Known as one of the finest dance bands for squares and contras, Roustabout has played for dances and performed in concerts from Florida to New Hampshire. The band has been featured at many festivals, including Pinewoods (Plymouth, Mass. ), Fiddle Head (Ashville, N.C.), Chesapeake Dance Weekend (Annapolis, MD), The Washington Folk Festival, The Takoma Park Festival, and numerous events sponsored by the Country Dance and Song Society.